As a hunter, you know there are plenty of ways to track an animal. Right now, using dogs is very popular as it exposes people to the thrill of the chase. And, using a high-powered rifle is never going to go out of fashion. Guns have been around for a long time and they aren’t going anywhere soon. Still, it doesn’t mean a crossbow isn’t the right piece of equipment for the job. Getting used to holding the biblical tool in your hand is incredibly exciting, and there is nothing as stylish as on the market. The problem is twofold: you don’t know where to start and you can’t trust most crossbow reviews. Typically, they just want to sell something. The great news is you’ve come to the right place. Here, we don’t do anything overly salesy; we simply bring you the information you need to make an informed decision. It’s important to start by saying that crossbows are no by means cheap, and any reviews that say otherwise are disingenuous. Most of them are modified for the user experience and to give you the best chance of making a hit. That being said, you can still pick the best crossbow for the money as long as it’s in your price range. Everybody wants the best bang for their buck, literally and metaphorically speaking. The crossbows in this review range from $100-$200, $200-$300, $300-$400, and $400-$500, all the way up to $1,000. Please note spending more money doesn’t always correlate into a better bow, but some of the greatest ones are pricey. The final decision is yours and yours alone, so be careful and give it plenty of thought before pulling the trigger. 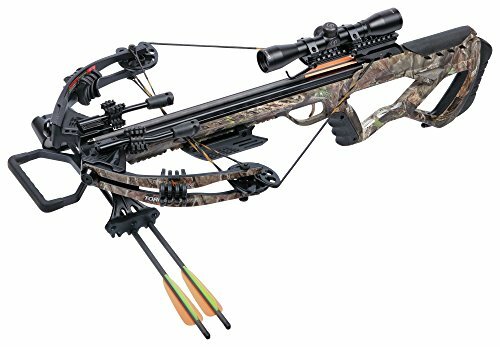 Here’s the stuff you’ve clicked on this post for – reviews of the best six crossbows on the market today, starting with the Pro STR. Cost wise, the Barnett Whitetail Pro STR is a midrange model which won’t break the bank. Typically, a middling crossbow can provide substandard features, but this isn’t the case with the Whitetail. With kinetic energy of 140 ft lbs and a power stroke of 16 inches, it’s on the high end of the scale. But, don’t worry about it letting you down from an accuracy perspective as the Pro STR has a trick up its sleeve. The step-through riser platform allows the user to shift the weight from the riser to the stock for a more stable platform. The result is that you don’t experience any ill effects of the power when you squeeze the trigger. Recoil is a big deal because of the level of the power stroke, which is why the Whitetail comes with dampeners. Plus, they are perfect for anyone who wants to hunt in stealth mode, as is the standard camouflage color. A downside is that the strings tend to fray if they aren’t properly lubricated after every ten shots. Even with the wax, it’s a bit of a hassle, especially if you’re out hunting. 400 Feet Per Second Crossbow in Tru Bark Camo. Package includes premium 4x32 illuminated scope, Rope Cocking Device, Side Mount Quiver, Two 22" Headhunter Arrows, and Lube wax. Draw Weight: 165 lbs. Kinetic Energy: 140 Ft. lbs. Power Stroke 16.375". Overall weight:6.9 lbs . Dimensions: 36.5" L x 20"W. Axle to Axle 17.625"
Pattented Step-Through Riser. String Dampeners for stealth like shooting. CNC Machined Aluminum Flight Track for smooth, quiet, and accurate shots. Ships to you mostly assembled. Allows for Intergration of Barnett Crank Cocking Device. Please don’t let the futuristic style but you off this crossbow. It may look a little alien, yet it comes with some fantastic features which people who buy the weapon love. 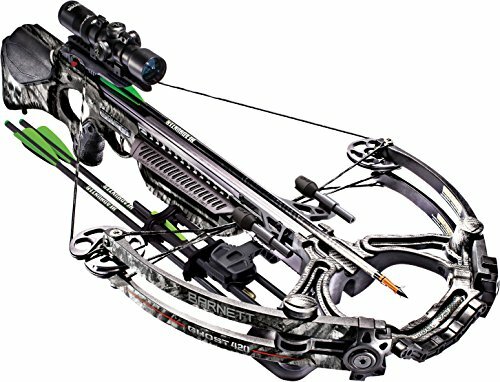 As far as a hunting crossbow goes, this is one of the best in the Barnett range because of its 185-pound draw weight. The extra power means you can fire an arrow at a rapid 420 feet per second, which the manufacturer admits is one of the fastest on the market. And, due to the carbon step-through riser and the aluminum flight tracker, the bow isn’t heavy. At least, it’s not for the number of add-ons is brings with it. The good news is this won’t impact the effectiveness of the shot. You already know about the draw weight, yet the kinetic energy is high too, at 149 ft lbs. Compared with the Ghost 375, that’s an additional 24 lbs of energy. Thanks to its illuminated scope and sight, shooters won’t have any problem tracking in low light or changing weather conditions. With the TriggerTech trigger system, the Ghost 420 has a smoothness as well as increased accuracy when shooting. It is worth noting it only has a single bolt assembly and it can be resistant which makes it hard to load. For over $900, hunters might want more from the manufacturer than a basic single bolt assembly. This crossbow delivers 50 fewer feet per second than the Ghost 420 at 370 fps. However, it is almost $800 cheaper at $195 on Amazon. 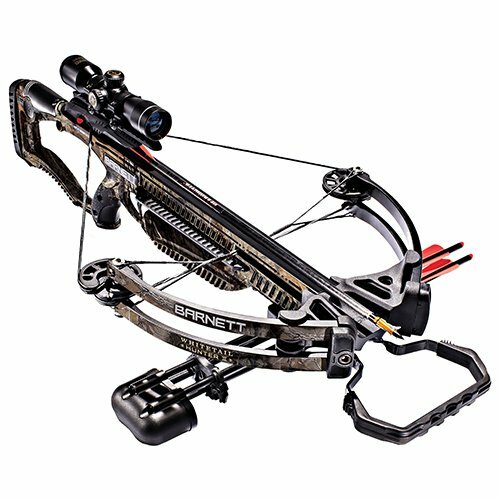 Plus, it’s arguably the best crossbow for deer hunting and big game on the list. First of all, it arrives fitted with a sniper which lets the user scope in and out to magnify the shot. Whether in low or bright light, it blocks out the elements and lights up the target. Plus, this feature is fully adjustable and perfect for left and right-handed people. Game animals are sensitive to sounds, which is why it has a string suppressing technology. Not only that, but it’s integrated into the bow for a quiet, vibration-free shot. And, there’s no need to fret about the size if it sounds like it’s damn difficult to carry around. The aluminum STR keeps the weight off, but do does the style. Unlike the others in this crossbow review, this is assault rifle-like in its design. The barrel and grip look and feel as if you have a AR 15 in your hands due to the 18” axle-to-axle width. It also comes with a shoulder sling in case the weight starts to become an issue. If money is a major factor, this has to be one of the best budget crossbows on the market right now. The above can cost as much as $100 to $200 depending on the quality and time of year, so the TenPoint Invader might save you money in the long run. Again, this is an AR-type crossbow so it is quite light already at 6.6 lbs without the accessories. What makes it one of the lightest in the industry is the ACUdraw cocking mechanism. The self-retracting rope which is integrated into the ACU reduces the poundage by up to 50%. On a long hunt, this will make all of the difference to your comfort levels and overall experience. However, there are a handful of drawbacks. Speed wise, the feet-per-second is down at 330. Although it’s not terrible, it is 90 down on the Ghost 420 and 40 down on the CenterPoint Sniper. Considering the difference in price between this and the CP, it’s quite a lot of velocity to lose. Also, Wicked Ridge claims it’s the narrowest yet the axle-to-axle width is wider than the CP sniper. The Tormentor is Whisper by name and whisper by nature. 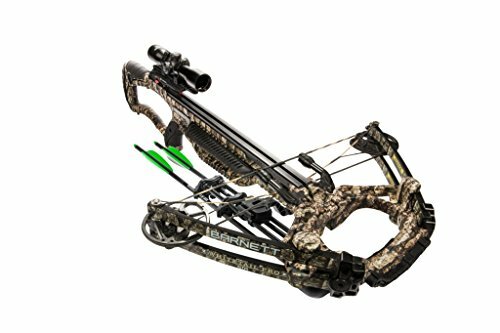 With only a 14” axle-to-axle when cocked, the bows slides out seamlessly without making a noise. Plus, this makes it easy to transport on a long hunting session. Probably the jewel in the crown of this ultimate camo weapon is the silencing system. The Whisper 380 comes equipped with a mechanism which keeps the noise to a minimum. And, at 380 feet-per-second, the target in your sights won’t have a clue what’s coming next. With the quad limbs and the compact design, there is no doubt this is designed for hunters who don’t want to be seen or heard while on the move. On the flip side, there isn’t much special about this bow if you’re not invested in the stealth element. The draw load is 185 lbs, which is standard, and there is an anti-dry system which is typical, too. You will love the auto-safety device that puts the user’s security front and center, yet it isn’t a novel thing either. In simple terms, this hunting crossbow is for anybody who takes silence seriously. With a 4×32 scope, you’ll be like the wind: gently passing through before striking. The Whitetail Hunter II is rated number one by Archery Crossbows on Amazon. Straight off the bat, you know what they provide is pretty good as it comes recommended by hunters. As a fully fledged member of the society, you know they are hard to please so this is an excellent sign. Of course, it isn’t the five-star rating which encourages people to buy this bow. For the most part, it’s that it delivers around the board without excelling at anything. Now, this might sound unappealing yet it means it’s consistent and reliable, something you need on a hunt. The overall weight is 6.4 pounds, which is around the average for the industry. The axle-to-axle width is 16 inches, give or take, and that’s common too. The dimensions are 34.25″L x 18.25″W, which means some crossbows are bigger and smaller. But, all these features combine to make it a force to be reckoned with. For example, the 34”L x 18”W gives it a solid base from which to fire. Regarding accuracy, this suggests you’ll get reliable results compared with a scope and a reticle. The 350 fps second is good, as is 103 ft lbs of kinetic energy. The draw weight is a little on the low side at 150 pounds. One thing which sets it apart is the 3lb zero-creep release that adds an extra safety element. Plus, it’s made in the USA for all the patriots who enjoy hunting. We’re aware that choosing a product is straightforward when there is a crossbow review to hand. But, what about when you’re out of your depth and don’t recognize the makes and models? Brand – although it sounds sloppy, you can make a purchase based on the manufacturer. At the very least, you won’t end up with a mediocre crossbow that won’t do the job. With the likes of TenPoint, Barnett and Wicked Range, you can be safe in the knowledge the product is legit. Others to look out for are Excalibur, Parker, Horton, and Pse. Speed – some people want to fire a shot as quickly as possible. If you fall into this category, a compound bow is the best option as it offers the terminal velocity. The alternatives are recurve and reserve limb bows, but they are better for accuracy, comfort, and stealth. Weight – carrying a crossbow around for hours on end is going to hurt. So, you want something which is light and not a burden. However, there is also the steadiness element to factor in as light bows are tricky to keep steady. As a rule, anything between six and seven pounds is the perfect mix. Durability – no one wants to spend hundreds of dollars on something that will break. With this in mind, keep an eye out for stainless steel and aluminum coated in nitrogen. Accessories such as lube wax should stop the ropes and bows from fraying too. Which one is the best crossbow? The answer is a personal decision. They all have their specific qualities and it’s down to you to pick a model which is an excellent overall fit.